NTCA and members of the tile industry have been strong supporters of the Gary Sinise Foundation’s Restoring Independence Supporting Empowerment (R.I.S.E.) 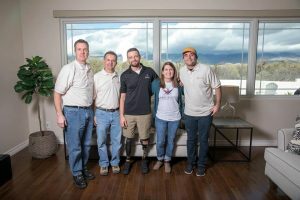 program, which builds specially-adapted smart homes tailored to the needs of wounded veterans across the nation. NTCA contractors John Mourelatos (l.) and James Woelfel at the home dedication. Recently, a 3,300 sq. ft. smart home was constructed in Tucson, Ariz., for United States Army Sergeant First Class (Ret.) Caleb Brewer and his family. 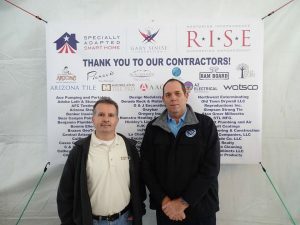 Two Arizona-based NTCA contractor members – Mourelatos Tile Pro from Tucson (also a NTCA State Ambassador) and Artcraft Granite, Marble and Tile, a NTCA Five-Star Contractor from Mesa — donated tile installation services, with materials for the project donated by Arizona Tile, and setting materials by MAPEI. United States Army Sergeant First Class Caleb Brewer (Ret.) , with wife Ashley and daughters Evelyn and Emily at the groundbreaking. United States Army Sergeant First Class Caleb Brewer (Ret.) joined the armed forces while in high school and served as an Intelligence Analyst in the Army Reserves and a Green Beret. 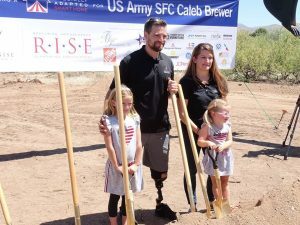 On December 4, 2016 (his 31st birthday), while deployed to Afghanistan, an explosion at a Taliban improvised explosive device (IED) factory resulted in Caleb losing both legs and sustaining other serious injuries. Yet just three months later, Caleb learned to walk on a single prosthetic leg and went on to relearn surfing, shooting, running, and rock climbing with his new prosthetic legs. He’s even completed events such as the Army 10 Miler run and the Bataan Memorial Death March. Caleb and his wife Ashley live with their two daughters, Evelyn and Emily, in Tucson, where he is currently taking care of his two daughters full time at home. 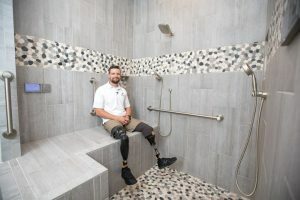 The 100% mortgage-free, specially-adapted smart home provided by the Gary Sinise Foundation will greatly increase his ability to perform necessary daily functions with ease. The Gary Sinise Foundation worked with Caleb to determine what challenges and obstacles he faced in his previous home, and custom designed a new home so that Caleb could function as independently as possible. In the kitchen, a French door oven was placed at an accessible height so Caleb could roll up, open the doors, and use the oven as anyone else would; ditto the microwave. The kitchen design included roll-under areas below the sink and cooktop and custom pull-down shelving in the cabinetry to give Caleb complete access to everything in the kitchen. The master bath shower design was customized so Caleb could pull his wheelchair up and transfer onto a bench with accessible controls and a hand-held shower faucet. Mourelatos Tile Pro constructed a large masonry bench in the shower and installed Sun Touch wire heating system, purchased from Emser Tile, to heat the top surface of the bench. Caleb in the shower installed by NTCA member Mourelatos Tile Pro of Tucson. “We worked closely with him on the finished height of the bench so that he can transfer to the bench from his wheelchair,” Mourelatos said. “We installed his shampoo niche lower above the bench and his wife’s shampoo niche higher up on the opposite wall.” Plenty of space allowed Caleb to maneuver in his wheelchair in the bathroom, including a roll-under area below his sink. A home gym and workshop areas were also incorporated into the design of the home for Caleb, so he could maintain a healthy lifestyle and work with others with disabilities in the community who are looking for innovative ways to stay in shape. A workshop area was also incorporated into the design of the home so he had a dedicated area to pursue this hobby and passion. A home automation package allows Caleb to control various functions of the home from an iPad or phone, such as: video surveillance, automated blinds/shades, security system, automatic door locks, climate control, audio, and video. 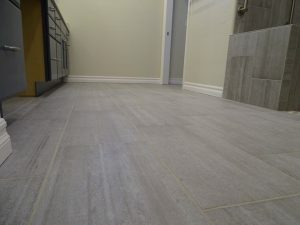 In addition to normal considerations such as wider hallways, doorways, zero clearance thresholds, and oversized rooms in general, it was key to make sure transitions between hardwood and tile were smooth. The durability and timelessness of the tile in the entries and bathrooms were important considerations in the home. And this is where our NTCA contractors came in. It was important that transitions – like this one in the the master bathroom — were smooth between different floor coverings. 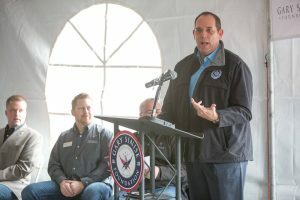 Jim Olson, NTCA assistant executive director, contacted John Mourelatos of Mourelatos Tile Pro and the Gary Sinise Foundation contacted James Woelfel of Artcraft Granite, Marble and Tile to determine if they were both interested in the project. 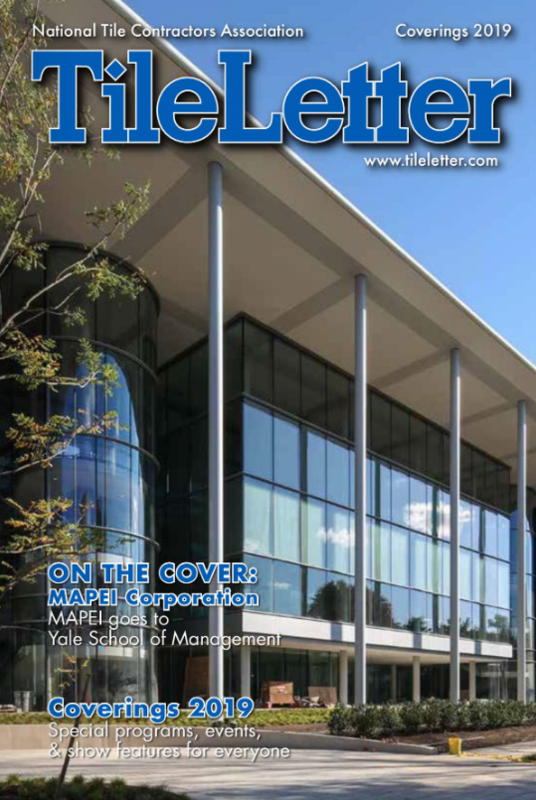 After an enthusiastic affirmation, builder Hayes Construction began working with Mourelatos and Woelfel on an estimate. Artcraft would take the kitchen, the laundry, Caleb’s training area restroom and his children’s bathroom. The builder, both contractors and Caleb met with Scott Kuzma at Arizona Tile to select the tile material; later on Mourelatos met with the Brewers to select grout colors for all the tiled areas. John Mourelatos, being local in Tucson, helped out with planning and coordinating of material and selection to minimize the need for Woelfel to drive up from Mesa, and the companies communicated about details via phone and email. “I kept James updated about the progress of the build and sent him pictures along the way prior to our start date,” Mourelatos said. 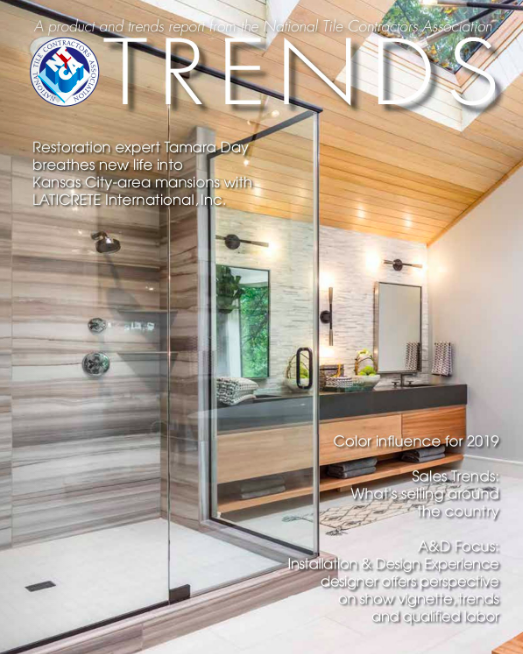 “Ed Siebern worked in the master bathroom while the three installers from Artcraft worked in the guest bath and kitchen.” Siebern, a Certified Tile Installer, was at the job full time to complete prep work and tile installation. The Mourelatos Tile Pro crew includes (L. to r.): Certified Tile Installer Ed Siebern, John Mourelatos, Caleb and Ashley Brewer and installer Cody Elmer. Both contractors were eager to donate their time on this project as a debt of gratitude. Mourelatos said over the years, he’d watched the work done on the R.I.S.E. program homes; so when he discovered one was being built “less than five miles from my house, I became excited about the opportunity,” he said. 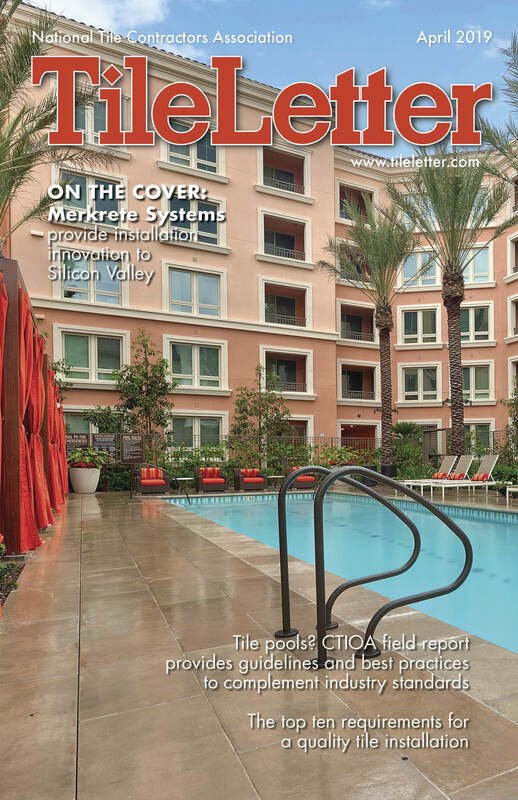 Editor for TileLetter, TileLetter Coverings, TREND and TECH publications. Lesley Goddin has been writing and journaling since her first diary at age 11, and drawing and sketching since she could hold a pencil. Her penchant for observation led to her becoming a paid professional as a trade journalist, publicist and is editor for TileLetter. 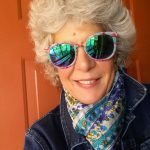 She has also written for Guideposts, Walls, Windows and Floors, Floor Covering Weekly, and Low Carb Energy.